Mumbling something about slipping on the ice, I mounted the big cruiser. The clerk glanced down at the pavement and my eyes followed. It was clean and dry. Crud. It was time for some rest. I rounded on the clerk. “Breakfast! Where’s breakfast?” That was about as articulate as I could get at the moment. From a summer run across the almost mythical Route 66, to tragedy and trials in the cold, forbidding winter mountains of the west, to high-speed jaunts though the storm-swept canyons of a city commute, ride with the author as he narrates a series of fantastic adventures with passion and humor. 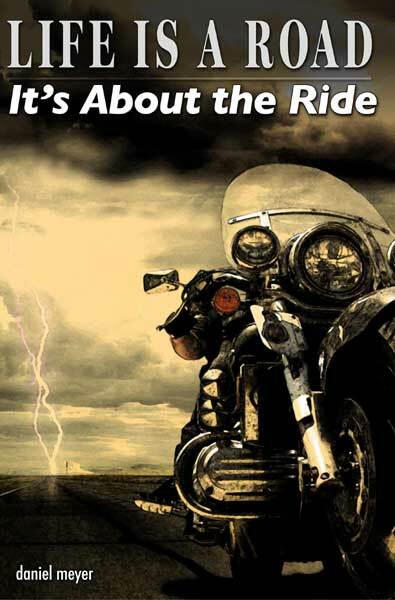 Find out why, It’s About the Ride. Life is a road. Live. Ride. See. Fly. Meyer’s latest is Life Is a Road, It’s About the Ride. The book is the fourth in the “Life Is a Road” series and in it Meyer continues to write eloquently about motorcycling and the spirit that drives those who ride. The stories cover the full range of human emotion: love, lust, rage, sadness, terror, joy; and that’s just one of the stories! Meyer speaks to the ideals of the motorcyclist: independence, honor, and passion.